When most people think of the Gulf of Mexico, surfing probably never crosses their mind. However, the gulf is more than capable of producing quality surf. The gulf waves are influenced by tropical weather, such as hurricanes and cold fronts, often producing much higher quality surf that most would expect. For those in the know, it is during hurricane season that gulf coast surfers have the highest hope for quality surf. Most named storms tend to track up the eastern coast of the United States, leaving Gulf residents in the clear. While the thought of a hurricane is certainly bittersweet, many local surfers are willing to risk the potential dangers if it means they can hit the waves. Prior to this week’s Hurricane and Tropical Storm watches and warnings, 2013 was the last time we saw enough activity to warrant weather alerts and it was Hurricanes Ike and Gustav in 2008 that created the last serious swell in the Gulf. The most consistent time of year for surfing in the Gulf is winter. The storms brought about by cold fronts can produce great surf. Despite cooler air and water temperatures, you can see many surfers along the gulf beaches when a cold front arrives. These winter swells generally begin with strong south winds and choppy surf. As the cold front moves across the state, the winds will switch to a west or north-west direction that can lead to some great waves and cold weather. Make no mistake, surfers in the gulf take advantage of any opportunity to catch a wave. This year, surfers benefited greatly from the El Nino weather pattern. Many days of favorable surf were enjoyed. Just a small disclaimer, if you’re a true Floridian the gulf temperatures can get cold! Take along a wetsuit if you want to give surfing a cold front a shot. If you are a local gulf coast resident or just simply vacationing, know that surfing is a definite possibility in the Gulf of Mexico. Although fickle, the gulf can offer some fun waves along the entire coast whether you are just earning or are an experienced surfer. There are multiple websites that offer daily updated surf reports such as Gulfster.com and Aurasurf.com. These are great resources to use for checking the surf forecast. 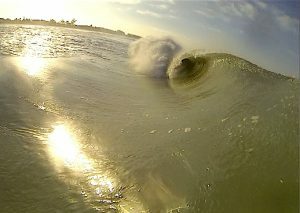 Check out the photo below for a glimpse of what the Gulf of Mexico can offer for anyone wanting to catch some waves.